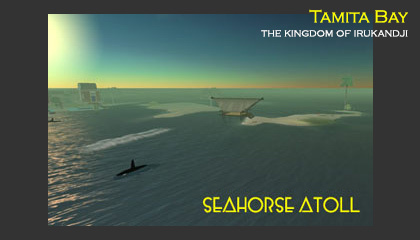 NOTE: This page is about Tamita Bay in Second Life. 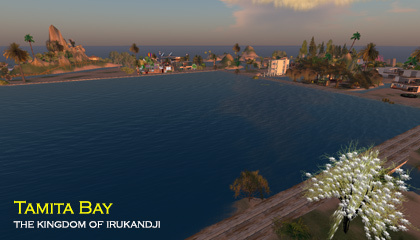 The InWorldz version is here: Tamita Bay in InWorldz 2013 to 2014. 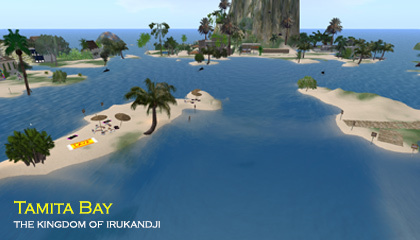 Tamita Bay was the second sim on the Irukandji Continent. I say the second sim, but it came online a few minutes before the other three bays surrounding the capital, Tamita Island, i.e. Minoan Atolls, Tiamo Reef, and Baie de l'Amore. However, my house on Tamita Island faced Tamita Bay so naturally I developed that view first. Tamita Bay was initially a broad shallow bay dotted with islets, and the most famous of those was Seahorse Atoll, named for its shape. A knee deep stroll from Tamita Island and Alantay Island, the tiny atoll was peppered with deck chairs and umbrellas. At night I would set up slow dance animations and piped old romantic classics through the estate radio station. Locals from across Irukandji would migrate there at days end to meet up and just chat the night away. Tamita Bay was also incredibly popular with new couples. 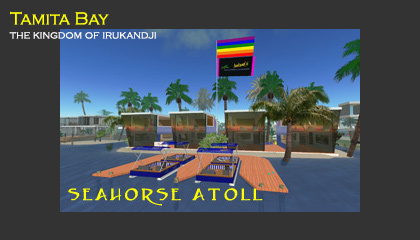 Many inworld romances took root on the majestic little atoll at the centre of the bay. Tamita Bay truly was a magical playground. Like Baie de l'Amore, which was thankfully never altered, Tamita Bay represented the true essence of Irukandji. Boating and watersports became so popular that a sailing club was inevitable, and in late 2008, the Royal Irukandji Yacht Club was constructed on Tamita Bay. Underwater also came alive with the relocation of the Irukandji Fish Farm from Manatu Island to Tamita Bay. Below you will find some additional photographs of Tamita Bay. 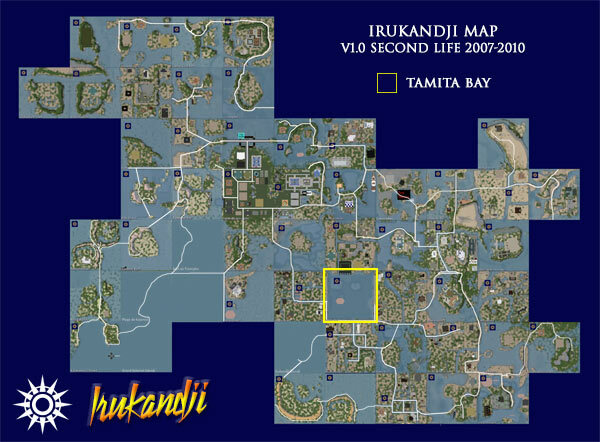 If you would like to explore more of the Irukandji continent, check out the main Islands of Irukandji page.